Reveals the actual teaching methods of the druids. • Provides new insights into the vast store of knowledge every druid was expected to know–knowledge that took fifteen to twenty years of rigorous study to acquire. • Translation of the classic Celtic text, Imcallam in da Thuarad, generally translated as The Colloquy of Two Sages. • By eminent Celtic scholar Christian J. Guyonvarc’h, author of Magic, medecine et divination chez les Celtes (Magic, Medicine, and Divination among the Celts). Because ancient druidic knowledge was transmitted orally, most of what has been represented as the teachings of the druids has been conjecture or fantasy. 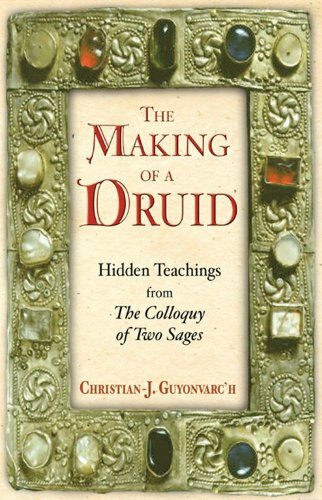 Now eminent Celtic scholar Christian J. Guyonvarc’h tears away the obscurity surrounding what the druids taught and how they taught it with his magisterial examination of the little-known Celtic text, Imcallam in da Thuarad, generally translated as The Colloquy of Two Sages.